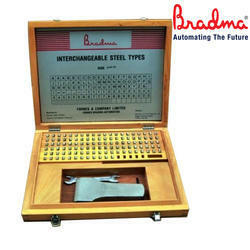 Offering you a complete choice of products which include bradma die hard interchangeable steel types (ists). Since our beginning, we are engaged in presenting a wide range of excellent quality Bradma Die Hard Interchangeable Steel Types (Ists). These sets are used in producing a thread close to the bottom of a blind hole. The offered sets are suitable for part numbering, batch and date coding on steels, castings, forgings, aluminum, brass, plastics, and paper. Also, the offered sets are manufactured using quality materials and latest technology. Apart from this, clients can get the sets from us at industry leading prices. Suitable for part numbering,batch and date coding,etc on steels,Castings,Forgings,Aluminum,Brass,Plastic,Paper.